The AST-02&3 Active Solar Tracking System can automatically track the sun to an accuracy of 0.02°. The AST-02 and AST-03 Active Solar Trackers have a Pan & Tilt Gearbox with integrated Single Board Computer and Global Positioning System. The included high-contrast Eye allows the Tracker to always stay locked onto the sun for effective real-time active tracking. The AST-02 has a single horizontal arm, The AST-03 type has dual horizontal arms. The horizontal axis and the vertical axis are each rotated by a stepper motor that is directly connected to a harmonic gearhead with zero backlash. The Eye responds only to a narrow bandwidth of near-infrared radiation, to give very high contrast between clear sun and cloud, for excellent sun tracking in real time. The GPS signal is used to automatically configure the Tracker for any geographic location and to provide precise time synchronization. Whenever the sun is obscured (by clouds) the system defaults to open-loop passive tracking using GPS position information. Whenever the sun is detected by the Eye the system actively tracks the sun under closed-loop control. The Tracker operates on 12VDC, and has low power requirement of 10W, making it suitable for solar powered sites. 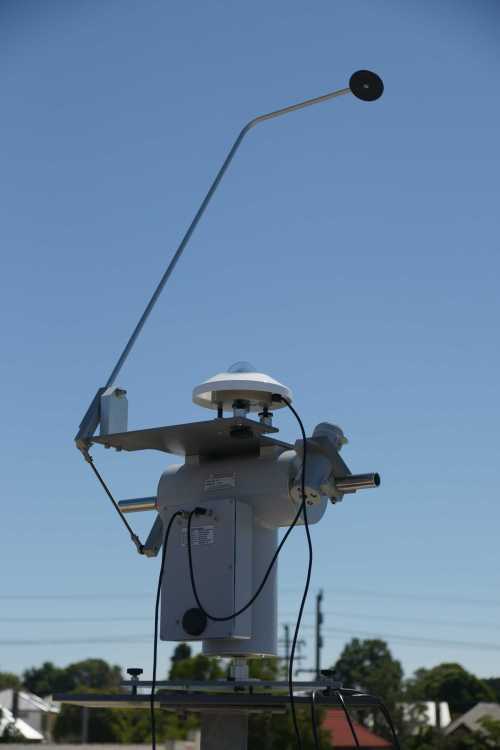 The image above shows the AST-03 Tracker with the optional SA02 Shading Arm Assembly, and the optional LS01 Levelling Stand.